Description (ebay): Steel construction. Holds standard sized napkins. To clean, wipe with a towel to dry. Steel construction. Attributestudio: Spectrum Diversified Designs, Inc.
Label: Spectrum Diversified Designs, Inc. Inspired by the iconic Midwestern arch, the decorative St. Louis Napkin Holder makes a great centerpiece to any kitchen or dining room table. This napkin holder keeps your napkins off the table and easily accessible. 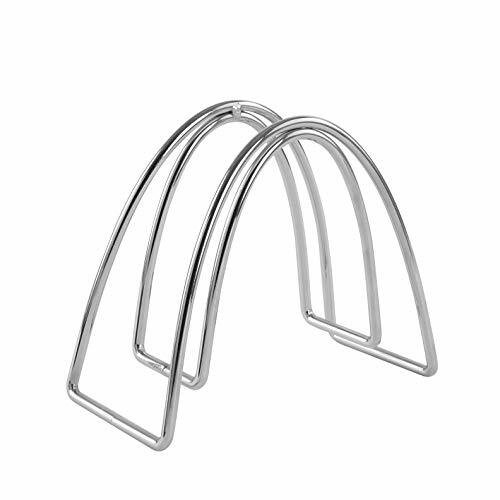 Made of sturdy steel, its unique design will add a contemporary touch to your home. Measures 3.5"L x 6.75"W x 5.75"H. Spectrum products incorporate original designs created by and for the exclusive use of Spectrum. Most of Spectrum’s products are protected by intellectual property rights including issued design patents and pending design patent applications. Protection for certain products may be provided and/or augmented by other federal and state proprietary rights including trademark, trade dress and copyright rights in the appearance and design of the products. Manufacturer Spectrum Diversified Designs, Inc. Publisher Spectrum Diversified Designs, Inc.
AttributeStudio Spectrum Diversified Designs, Inc.
Label Spectrum Diversified Designs, Inc. Studio Spectrum Diversified Designs, Inc.